DataPath enters the maritime satellite communications market with the new Maritime Antenna System. Built with a unique 4-axes gimbal technology, the system is ideal for vessels operating in harsh and unfriendly environments. Therefore, users will experience no loss of electromagnetic compatibility, radio performance or reliability. The solution features proven technology. 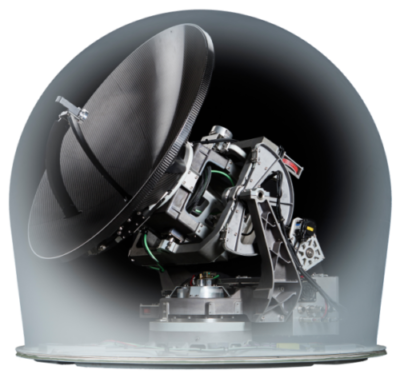 It is fast, robust and boasts no dead angles — features imperative in a maritime satcom solution. The antenna is easy to install, light and small – hence reliable and providing superior radio performance to support mission critical applications used on a modern vessels. Furthermore, it also is fast — due to the unique gimbal design and the gradient satellite tracking method on all 4 axes. The antenna locks on the satellite within eight seconds, starting from its parking position. Above all, the DataPath Maritime Antenna System is tested and approved based on military standard specifications for vibration, shock, and EMC according to MIL STD 810G and MIL STD 461F. Download our brochure and data sheet to learn more.